One and a half year after I switched from Wordpress to Pluxml, I changed again my website because I wasn't happy anymore with the global design. I wanted to change my blog because it had some issues concerning typography and display on mobile: it wasn't very comfortable to let people read long texts. For a blog, it's quite a paradox. The blog also had some minor issues, like some pages with the CMS default design and other pages which I didn't design well, so the overall experience of my website wasn't very consistent. As I said in my previous post about my new logo, the way how a logo, or here a website, is designed, tells a lot about a person's personality. So, the main reasons I changed the design was to improve the readability of the content and also to tell people "hey, I like to apply the KISS principle on what I do. So, I applied it on my website". Hope you enjoy the new design! You found an error in this article? Some advice? 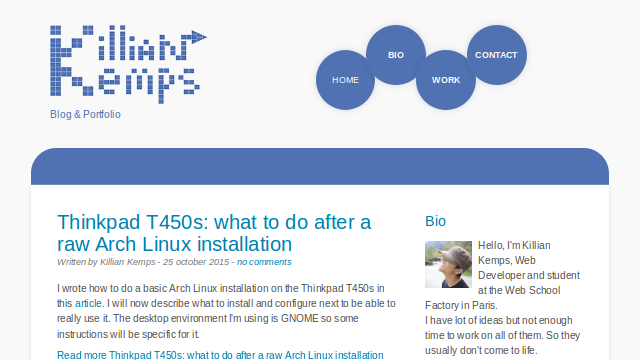 You can send a comment by email to "blog at killiankemps.fr" with "[Comment][en][New design for my website]" as subject.